The desks are open during Mall hours and are available to assist guests with questions as well as offer the following services. 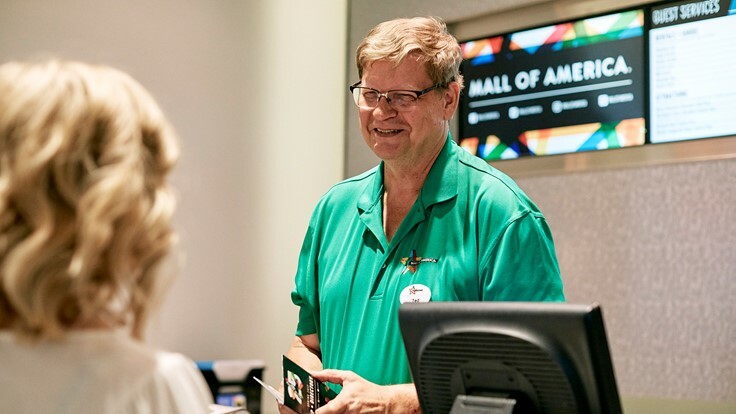 Gift Cards, MOA® Coupon Books and most attractions passes are available for purchase at all Guest Service locations. To purchase a Coupon Book online click here to visit our online store. For more information on gift cards specifically, visit Mall of America gift cards. All-day locker rentals are available in a variety of sizes. Lockers are self-serve and accept cash or card. Single and double strollers, wheelchairs and shopping carts are available for rent at all guest service desks. All rentals require a refundable $5 deposit. All equipment must be returned before Mall close. Unreturned or damaged equipment will be assessed the full value on the guest’s credit card. As of January 1, 2019, refundable deposits for all equipment will be $10. All restrooms are handicap accessible and family restrooms are located on the first floor by each entrance. Lose something at the Mall? Our guest service team members are happy to assist. There is also an online form available for missing items claims. Due to the number of items turned in, we are only able to hold items for one week before they are donated to charity. For phone numbers to our attractions, visit here. Hotel shuttles, taxis and tour buses drop off and pick up passengers at the North Entrance. This entrance is located in the Mall parking lot east of IKEA and north of Lindau Lane. Daily shuttles to and from Mystic Lake Casino Hotel are located in the Transit Center in the sub-level of the east parking ramp off of 24th Avenue. Please note that RVs are not allowed to park or drop off here. RV, semi-trailer truck, school bus and charter bus parking is only allowed in the Lindau Lot, located next to IKEA. Any vehicle left unattended in the drop off/pick up area is subject to towing at the owner's expense. There is no overnight parking at Mall of America, including in the Lindau Lot. There is no dropping off, picking up or parking allowed on the ring road surrounding Mall of America. Please park vehicles in designated parking lots and ramps. Any vehicle left unattended on the ring road will be subject to tow at the owner's expense. Deliveries must utilize the inspection check point located on the east side of Mall of America, off 24th Avenue. All delivery vehicles are subject to inspection. Documentation supporting the delivery must be provided at the checkpoint. Vehicles with trailers, semi-trailer trucks, box trucks and any other oversized vehicle must park in Lindau Lot. Stockmen's Truck Stop is located 13 miles from MOA in South St. Paul off I-494. Call 651.455.0034 for more information. Lebanon Hills Regional Park is located 9 miles from MOA next to the Minnesota Zoo in Eagan off Highway 77. Call 651.688.1376 for more information. Mystic Lake Casino Campgrounds is located 20 miles from MOA in Prior Lake, west of I-35W. Call 952.445.9000 for more information.